What is Inside a Bacterial Cell? Home > Introducing Bacteria > What is Inside a Bacterial Cell? Every bacterial cell is classed as a simple type of cell and described as prokaryotic. Bacteria are the only type of prokaryotic cell – viruses are not cells and the cells of plants and animals, even the simpler, single-celled organisms, are classed as eukaryotic cells. Bacterial cells can either be spherical, these are termed cocci, or rod-shaped, which are termed bacilli. Whatever their shape, every bacterium has a cell wall, which keeps its contents together and protects it from the outside world. A bacterial cell wall is rigid but permeable; it lets many different molecules travel in and out. 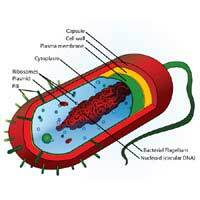 Some bacteria have a capsule, a slime layer that encases the cell wall. This is another protection for the bacterium, and the capsule often contains proteins and sugars that let the bacterial cell stick to surfaces, such as the cells inside the human intestine. Many bacterial cells have short tubes that stick out over their surface. These are called pili and they are used to transfer molecules, bacterial plasmids from one bacterial cell to another. Bacterial plasmids are short stretches of bacterial DNA that carry useful genes, such as those that confer antibiotic resistance. The other feature of the bacterial cell wall is that it often houses a flagellum at one end. Bacilli most frequently have flagellae, which rotate at the base, causing the long, whip-like flagella to propel the bacterium through the fluid it lives in. Just inside the cell wall is the bacterial cell membrane. This is a layer of lipid molecules arranged in a double layer. Proteins studded into the lipid bilayer transport other molecules in and out of the bacterial cell, such as nutrients, dissolved oxygen and waste. The fluid enclosed by the cell wall is called the bacterial cell cytoplasm. Under a light microscope, this just looks like fluid, but a more powerful electron microscope shows it is anything but. The main feature of the cytoplasm is the bacterial genome, which is the mass of bacterial DNA that forms a clump inside the cell. In plant and animal cells, DNA is separated into a discrete nucleus, but bacterial DNA is free. Plasmids exist separately from the main genome as circles of DNA that float around. All of the functions of the bacterial cell are controlled by the DNA, which is used as a template to make all the proteins that the bacterium needs to live. The process of reading off the instructions in the DNA and making the bacterial proteins is the job of tiny spherical organelles called ribosomes. Bacterial ribosomes are free in the cytoplasm, and they attach to genetic material to make proteins, and then float away again when finished. Many bacteria have this very simple and basic overall structure but some specialised bacteria have other inclusions in their cytoplasm that help them survive in specific environments. Species of bacteria that live where food can be in short supply often have nutrient storage granules. These can store glycogen or nitrates or raw materials such as sulphur compounds either in vacuoles or as granules. Some bacteria that live in water have gas pockets that they use to control their buoyancy. Possibly the most unusual bacterial cells are those that are magnetic, or more technically, magnetotactic. These bacterial cells can navigate using the magnetic field of the Earth and contain membrane-bound vacuoles that enclose particles of magnetite. Although the structure of bacterial cells is relatively basic, the chemical processes that go on inside the cell, allowing it to live and divide, survive in different environments, and even set up infections in plants, animals and humans, are far from simple. Even at the level of the bacterium, the processes of life are complex and amazing.